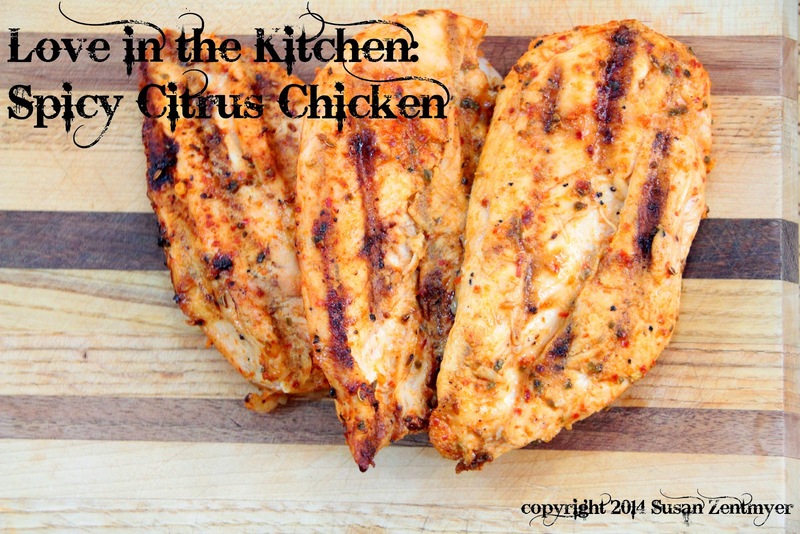 Today Love from the Grill brings you chicken. Chicken is one of the most popular meats in the US - in 2012, Americans were eating almost 60 pounds of chicken per person each year. Chicken has become such a staple of the American diet that it's hard to imagine a time when we weren't eating much of it at all. The change has been dramatic, however. In the 1950s, Americans ate an average of only 16 pounds of chicken per person every year. By 2000, that number grew to 53 pounds per year. 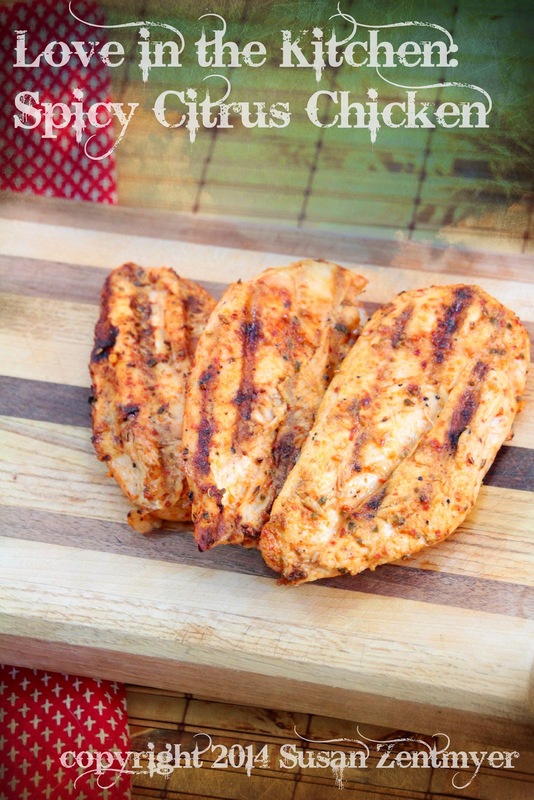 Chicken breasts are kind of a blank slate. They go so well with so many different flavors - but you want to make sure that you don't overcook them. Overcooked chicken is dry and tough, not tasty. Urban Accents is a spice company in Chicago, founded, they are proud to say "with the goal of bringing premium, all natural and visually appealing herbs and seasonings to the contemporary home cook". 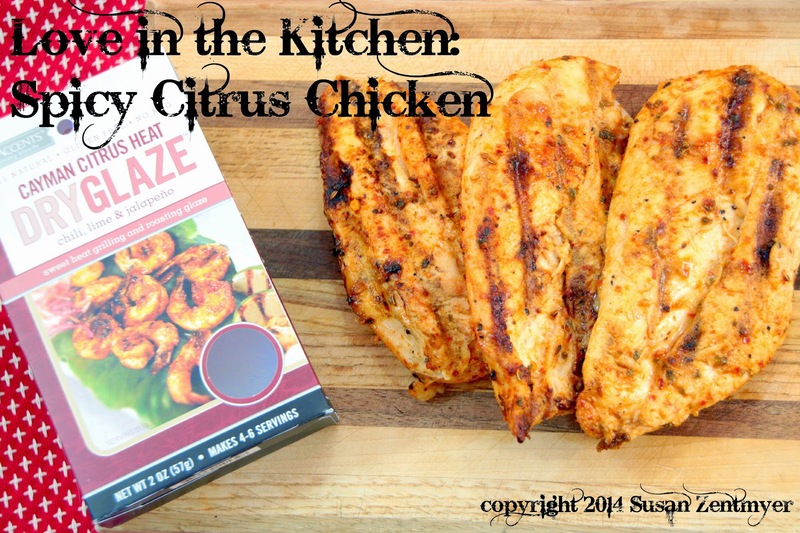 I received a box of dry glaze grilling mixes to sample from them, and I immediately tried the Cayman Citrus Heat Dry Glaze with chicken breasts. The dry glaze was really easy to use. I coated the chicken breasts in buttermilk to seal in the moisture, then covered them with the dry glaze. I let it sit for about 30 minutes while I heated the grill, then put them on the grill. Grill a few minutes per side over direct medium-high heat to both brown and cook the chicken breasts through at the same time. That being said, it's a good idea to always have a two-zone fire—with all the coals piled on one side of the charcoal grate—in case the chicken browns before it's done cooking through. This way you can finish the chicken up on the cool side of the grill, covered, and avoid burning the the breasts if need be. These were fantastic! The dry glaze was terrifically flavorful, fairly spicy (in the best possible way) with a kick of citrus, and gave the most amazing crusty finish. Urban Accents has other wonderful dry glaze flavors - including Athenian Herb, Vermont Grill (maple! ), and Santa Fe BBQ - as well as other tasty offerings like their delicious corn on the cob seasonings (Chipotle Parmesan and Spicy Chile Lime!). You can also find gift sets, perfect hostess gifts for that upcoming barbeque! *The opinions above are strictly my own. I was provided a product to sample and was not compensated for my review in any other way. A BIG thank you to Urban Accents for providing me with the opportunity to try these grilling rubs!